Open House - June 16th - Welcome to Foxview Stables! 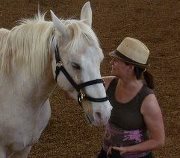 Even though the Open House has come and gone, please do not hesitate to contact Marlene at 613-277-4402 should you wish your own private tour and/or wish to book an Equus Coaching session. When was the last time you felt truly in the moment and fully alive? We suspect, you know and have had these moments, so our fingers are crossed you would like more! Come out and spend a few hours out in the country and reconnect with nature to relax, have some fun and meet some very special horses, a fun-loving puppy and a barn cat extraordinaire. Foxview Stables is planning an afternoon for you, your family and friends. Marlene and Maureen are very excited to share what they are learning in "playing" with horses. The excitement is happening on Saturday, June 16th. We will start at 1 p.m. with an Equus Coaching (Life coaching facilitated by horses) demonstration. Find out how the horses see you, and how this changes how you see yourself. Find out how to connect to your life's purpose and how to set healthy and loving boundaries. Learn how to lead and communicate in a whole new way. We will have videos at 2 p.m., and of course yummy refreshments. To awaken your senses further, there will be a tour of the facility at 3 p.m., and yes, there might even be a fox sighting! To help us with our preparations, please let us know you are coming by June 13th via e-mail or by calling Marlene at 613-277-4402. For "sneak previews" check out the Foxview Stables web site at www.foxviewstables.com. We are located at 3158 Stagecoach Road, Osgoode, Ontario, K0A 2W0. If you would like to access a google map, here you go: http://www.foxviewstables.com/contact-us.html All of us are really looking forward to meeting you (and we do mean all of us)!"